Bencharong ware is a polychrome porcelain made in the city of Jingdezhen (the porcelain capital of China) and richly decorated to Thai tastes with bright enamel glazes. It is thought that Buddhist books and paintings were supplied as references and sent to Guangzhou merchants, who acted as intermediaries to the Chinese potters and decorators for foreign orders. As with Western orders, new, alien ceramic shapes were communicated by maquettes in wood or perhaps metal.While the name Bencharong derives from the sanskrit words ‘pancha’ and ‘ranga’ meaning five colours, Bencharong wares can also be found with as little as three and as many as eight colours. 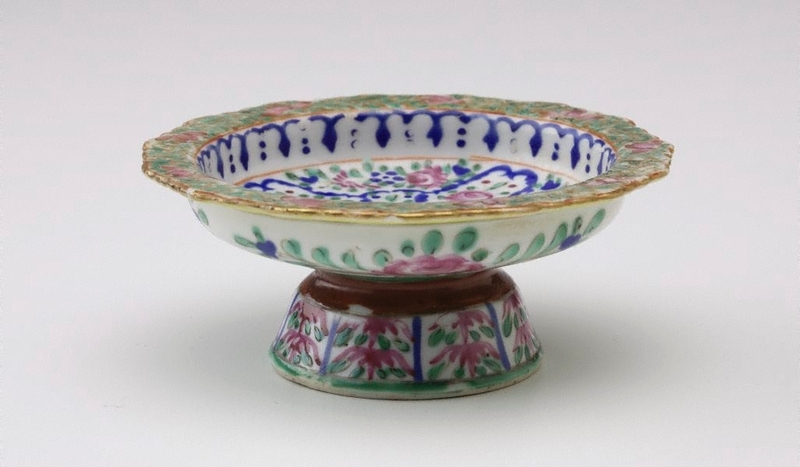 Bencharong wares were first commissioned by the Thai kings of Ayutthaya in the 18th century during a peaceful period of rule that was congenial to picnics and tours and where Bencharong wares could be used to store and serve food. After the fall of Autthaya to the Burmese in 1767 Bencharong wares became more widely used and Lain Nam Thong wares superseded them as the exclusive wares of royalty.